Aim of new state program is to create "smart schools." Trent Nelson | The Salt Lake Tribune Camille Farias instructs students at Dixon Middle School in Provo, Utah, with an iPad, Tuesday September 25, 2012. "The volume of work they can do increases," Farias said of her students' use of the new technology. Trent Nelson | The Salt Lake Tribune Jacen Hansen and Adam Boot read books on iPads during a reading class at Dixon Middle School in Provo, Utah, Tuesday September 25, 2012. Trent Nelson | The Salt Lake Tribune Dixon Middle School teacher Leann Moody helps Jacen Hansen with an iPad during a reading class in Provo, Utah, Tuesday September 25, 2012. Trent Nelson | The Salt Lake Tribune Elizabeth Sibrian, a student at Dixon Middle School in Provo, Utah, uses an iPad in an ESL class, Tuesday September 25, 2012. Trent Nelson | The Salt Lake Tribune Elizabeth Sibrian, a student at Dixon Middle School in Provo, Utah, gets help using an iPad from aid Amy Sights in an ESL class, Tuesday September 25, 2012. Provo • For years, teachers have handed out word-search worksheets to kids. Students hand them in, teachers correct them one-by-one and return the assignments to children days later, when errors can finally be reviewed. But in Leann Moody's class for struggling readers at Dixon Middle School in Provo, students perform word searches on iPads. They race against a timer, flicking their fingers to choose letters and earn points. When they make spelling errors, the app on their iPad immediately tells them so, then urges them to try again. "It's immediate, but they also have to think. They come wired for this these days," Moody said of her students. Dixon has more than 70 iPads, but the school is about to get hundreds more  one for each student  as part of a new state program. Dixon is one of three Utah schools that have been selected to receive $3 million worth of technology, training and support to become a "smart school" over the next three years. 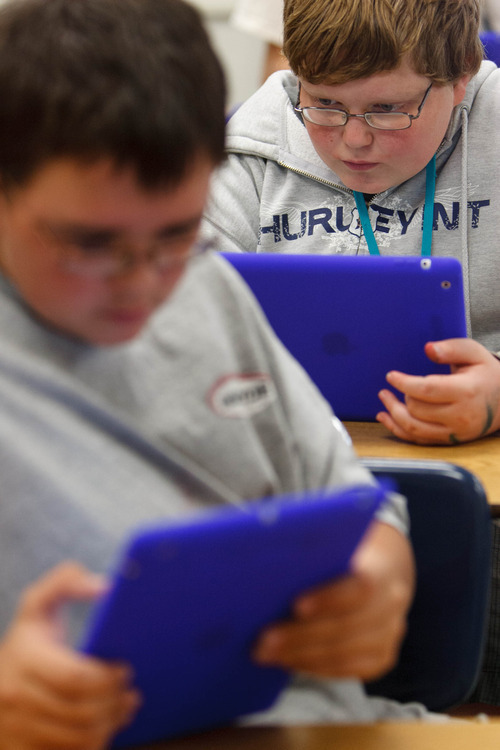 North Sevier High and Gunnison Valley Elementary will also get iPads for each student, along with more desktop computers, a technology infrastructure, audio systems, teacher training, Apple TVs and high-definition TVs for classrooms. The schools were chosen from among 49 statewide that applied for the technology as part of a program passed into law earlier this year. "Ultimately, we want to be able to prepare our students to be a part of something really unique that will prepare them for college and career readiness in a way we haven't been able to do before," said Jarod Sites, Dixon principal. Sen. Jerry Stevenson, R-Layton, who sponsored the smart schools legislation, said the technology could help students in Utah's large classes get more personalized instruction. In the past, some lawmakers and educators have worried that it's not enough to just give schools technology  teachers must be taught how to use it. But the new program offered at the three Utah schools, implemented by the Park City-based company ­iSchool Campus, will include thorough teacher training. 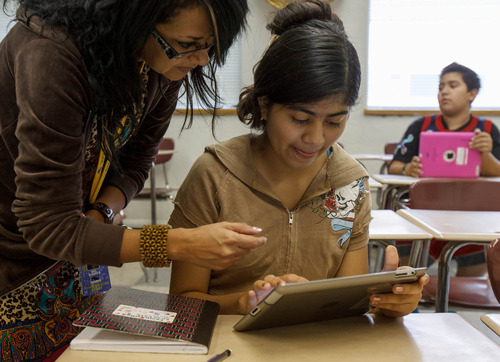 "The iPad is a really powerful tool, but a teacher is a more powerful tool," Sites said. "Without the teacher, it's just a toy." Educators are optimistic about the program's potential. "We've gone from a radio world to a TV video world, and now we're in a digital world," said Grant Hansen, principal at Gunnison Valley. "I think that we will engage students and draw them into learning better by using technology." Though many educators are excited about the program now, initially some were skeptical. When Stevenson introduced the bill behind the program, SB248, just four days before the end of the last legislative session, some expressed concern that it was a "vendor bill," written with a specific company in mind to win the contract. Several iSchool employees accompanied Stevenson to the first hearing. But he said the process was fair. "On the front end, ­iSchool had some input into it," Stevenson said, "but when we got back to the bid process it was broadened to the point we could make sure we had a range of bidders." In the end, iSchool beat out three other bidders to win the contract. The three selected schools will likely get the devices in the next month or two, and politics aside, teachers are excited. The three schools will join eight private and charter schools across the country already using iSchool. Teachers like Moody, who are already using some iPads, say kids simply seem more engaged with the technology. "Just the fact that it's in their hands has made a big difference for these guys because I think they are tactile learners," Moody said. On a recent day in her classroom, students read novels, played the word search game and spent time on Edmodo, an app that looks just like Facebook but is for learning. "I think it helps because a lot of the kids nowadays like electronic stuff," said eighth-grader Adam Boot of the tablets. "It's awesome." In a different part of the school building, students learning English as a second language in Camille Farias' class practiced writing on the devices. They used a program that instantly showed them spelling and grammatical mistakes. The program also rated their writing skills. "The volume of work they can do increases," Farias said of her students' use of the new technology. "The quality of the feedback increases, and the quality of the data I can keep on them increases." Dixon and Gunnison Valley school leaders said they may eventually send the iPads home with students in the evenings. The tablets will have filters on them that will prohibit students from viewing inappropriate content whether at school or at home, said Brayden Wardrop, ­iSchool director of business development. The company will also turn off features such as messaging, non-educational games and access to Apple's app store, so students use the devices only for educational purposes, Wardrop said. Hansen, of Gunnison Valley, is pumped for the possibilities. "We live in a rural part of Utah, and some of our kids have never really been as far as Provo," Hansen said, "and they'll be able to have the world come to us."